Increase consistency and confidence in data-driven decisions. The goals of the session was to help attendees understand how early warning and goal setting can improve student outcomes and to ensure that all attendees have a clear understanding of how myTrack can help educators improve student outcomes. 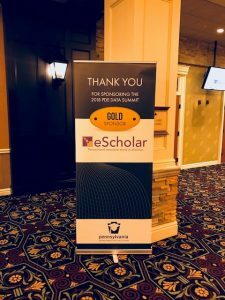 This session reviewed the eScholar API and how it will cut your processes in half and save time. On the SIS vendor panel we welcomed, Get Alma, PowerSchool, and Computer Resources. We are aware that this session was full and some interested attendees were turned away. If you have any questions on this session or would like more information on what was covered, please reach out to Mishan at mhorezvani@escholar.com to learn more.